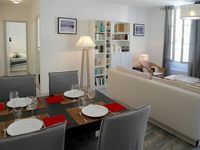 Properties in Saint-Capraise-d'Eymet average 4.7 out of 5 stars. Secluded Perigordine Farmhouse In Monbazillac, Near Bergerac. Large Heated Pool. Property 10: Secluded Perigordine Farmhouse In Monbazillac, Near Bergerac. Large Heated Pool. Charming hamlet of Périgord for an idyllic stay ..
Property 11: Charming hamlet of Périgord for an idyllic stay ..
Holiday villa with wifi and swimming pool on large park. Property 16: Holiday villa with wifi and swimming pool on large park. Glorious riverside town apartment with private garden overlooking La Dordogne . Property 18: Glorious riverside town apartment with private garden overlooking La Dordogne . Can&rsquo;t wait to go back! Maison de la Paix is a stunning home with tons of character and charm. The beds were so comfortable and the kitchen was equipped with everything you could possibly need. The location, in the town of Issigeac, can&rsquo;t be beat. All the essentials are steps from your front door. John and Louise are dedicated hosts and Brenda gave the warmest welcome. We can&rsquo;t wait to return! Spacious and comfortable apartment with everything you need for a wonderful stay.